I thought I'd start this thread as I'm interested in finding out how other dyspraxic mums (particularly stay home mums) have coped with getting the housework done after having a baby. My little girl is now 8 months old (she's my first) so she's not that new anymore, and I know I should really be getting the hang of my new role now, but I'm still just not managing to get enough done around the house and my poor, long suffering husband has to do too much after working long hours. The house isn't a bomb site. I'm a very messy person by nature but I really am trying so I do tidy around everyday, put washing on, empty and refill the dishwasher etc. Obviously I also do several nappy changes each day and I feed her every few hours. Plus we get out the house most days and go to various baby groups and activities. These are probably my downfall, I know, as it takes me a long time getting us both ready and out the door and then there's the time at the groups obviously. Anyway with doing all that (and never having a quiet moment to myself to think straight, the kid never naps!). I'm failing horribly to get anymore housework done. I never vacuum or dust, or clean the bathrooms and I've always had no clue when it comes to cooking, so my poor husband does all that, which I know isn't right. I'm honestly exhausted though. I don't get much sleep and I never just relax. I know I should go to less groups but I think they're the only bit of my efforts as a mum that I feel I'm succeeding at. If I'm just home all day doing, and failing at, housework I think I'll go mad! So the groups are for me too, not just my daughter, but they are wonderful for her too (we do a music group, swimming, tumble tots and the odd other toddler group). I do offer to clean the house properly at the weekends, if my husband will watch our daughter for me, but he says I'm too slow at getting the cleaning done and he's better off doing it himself. He has a point - it takes me forever! He is a really nice guy but we do argue about this a lot and I feel backed into a corner because I know I should be doing better. I haven't been formally assessed as dyspraxic, but I'm pretty sure I am, so he doesn't understand why I am the way I am. Help! Have other dyspraxic mums struggled getting it all done? Any tips for coping? How did you keep your relationships in tact? P.s. I just realised how crazy long this post is! Sorry! I really feel for you, and can relate to a lot of what you say. My 'baby' is now 14 (where did the time go?!) so I hope I might have something helpful to say. Although none of us are experts at being parents, and I'm sure everyone finds it a struggle sometimes, dyspraxic or not. I think it's great your daughter is going to these baby groups as it will really benefit her. We did a 'Music with Mummy' class and my daughter loves singing even now. It's so good to socialise, for you and her. I wish I'd known about dyspraxia when my daughter was a baby. I'd always had difficulties with things like driving (took me three years! ), organisation, etc and had no clue why. I used to think I was stupid (even though I did well academically) because I struggled with everyday things like putting up the pushchair or getting the washing up done! I had a diagnosis of dyspraxia about four years ago now and it's changed my life for the better. I've actually improved in a lot of things, and just knowing has been helpful. It's been and up and down journey but I now work with students with learning difficulties/disabilities and it gives me a lot of patience and understanding. I always found housework difficult, partly because I keep too much stuff, and when I was tidying up I would try to get every minor thing in order (like each jigsaw completed or pens in order) instead of doing a quick tidy up to make things look OK on the surface, if that makes sense. I struggled with the order to do things in. A good tip I've found (although it's harder with a baby) is that I write a list of things to do and I try to have a timetable (even if I can't stick to it 100% which you never can anyway). I often set a timer - say I'll set my timer for half an hour and spend all that time tidying, or doing a particular job. Don't try to do too many things at once, and concentrate on important stuff like washing up. I also write a list of meals for the week (well on a good week I do!) and buy the right stuff which saves time and money. Your husband sounds well-organised. It could be worth sitting down with him and working out a plan - perhaps to share some of the housework. My husband is organised and gets more done than I can in the same time and he has helped me with organising things. It's hard not to feel a bit silly, but I found it works. WE have to learn not to be so hard on ourselves as we all have different skills. I probably have more patience. It's a hard balance sometimes. I wish I'd gone to more social groups in a way when my daughter was a baby, although too many, and it can become a chore. Maybe two a week would be good, although days can be long at home can't they? I still find now that on the days I work I get more done than when I'm at home all day. It can be disheartening to wake up and see just housework and shopping ahead! Also the Dyspraxia Foundation is very good for advice. I also read a book once by Mary Colley called 'Living with Dyspraxia' which had some good tips. Also Jill Eckersley 'Coping with Dyspraxia'. Actually when you get to know people, I often find that a lot of people are struggling with organisation and other things - there is too much to do nowadays and pressure to be perfect, which we don't need to take notice of but it can be hard to ignore. I wish you luck and i hope you enjoy life with your baby. It sounds like you are doing a good job, and it's better to spend more time with baby than have a perfect house and baby doesn't get attention. Also if these were paid jobs we wouldn't be expected to do childcare and housework at the same time, they would be separate jobs of childminder/cleaner etc. There is a lot to do in a day. Anyway I hope this is helpful. Thank you for your reply. It's lovely just to know I'm not the only one who finds it a struggle getting everything done sometimes. It's also nice to know you think the groups are a good idea. I think we get a lot out of them although it's true that I may be over grouping! The funny thing is I was sooooo nervous about the first few groups I went to. We didn't go to anything for the first four months my daughter was alive and I chickened out and walked away the first time I tried to take her to a parent and baby group! We got through the door the next week though and it felt like such an achievement just being there. And now I think I've become a bit of a group addict! I'm making friends for the first time in years and I can't get enough. I like the routine the groups give me too, making my week a lot more structured. I probably do need to find a bit more of a balance with the housework though. Currently I go to groups 4 days during the week plus swimming on a Saturday. However, I find I'm more motivated getting things done once I've been out the house, like you said you found sometimes. All the same I think I'll try dropping my least favourite group and see if one more housework day helps. Once I've got the extra day I will then need to work on strategies for getting it all done. I can really relate to your tendency to keep too much stuff and your tendency to get hung up on over doing tidying and doing every little thing rather than prioritising the most important bits. That is why housework takes me so long (that and my tendency to daydream!). I used to never attempt housework without a list and a timetable (like you suggested). I think that's what's really thrown me now I have a baby. I don't find they really work with her in the mix and I just get frustrated that I can't stick to my times. I've had to abandon all my coping strategies! Arrrgh! Still I think chatting to my far more organised husband about who does what and how has to be a good idea .I will also try the books you suggested and looking at the dyspraxia foundation website, so thank you for those tips. Just reading your reply cheered me up no end though. A little empathy makes all the difference! P.s. Good luck with the dog and well done on mastering the extendable lead!! I'd love to have a dog but perhaps not just yet with the baby! Good to hear back from you. It's always hard finding a balance isn't it? I think you're probably like me, and you like your day to be structured. I get long holidays from college, which sounds great (and it is in a lot of ways!) but I struggle sometimes when nothing is planned. I'm pleased what I send was helpful, I didn't want to be talking down to people when I write these things, just that I wish I'd known these sorts of things earlier. Just knowing there is something called dyspraxia, and other people have it, is a comfort to me! Not that I want other people to suffer, but you know what I mean! I couldn't understand why I did certain things, and struggled with certain things. When my daughter was a baby, it took me four weeks to go out on my own with her (I had a Caesarian, but even so ...) and my husband came home one lunchtime and put up the pram and said "you must go out"! Luckily I met another lady with her baby who I became friends with - it was her second, so she had more experience! I used to compare myself with other people - they were taking their babies on holiday or up to London, and there was me struggling to get round Tescos!! I know it sounds silly, and doesn't matter know, but at the time I was upset. I also worked in a pre-school when my daughter started school. I loved the kids, and enjoyed a lot of it, but I used to really struggle to get all the kitchen tasks done when it was my turn - cutting up fruit, making drinks, washing up and was much slower than everyone else. Once they said something to me about it, and about putting out equipment, and that I just had to "get on with it". I came home and cried for a couple of hours! Although I am happy to have my daughter, I've found that since I've been at home/working in schools i started to struggle with things I used to at school, and I'd almost forgotten about, and didn't have to deal with in an office. The funny thing was that at the pre-school they said to me why don't you not do the kitchen and work 1:! with a boy who was struggling a bit I think he probably had Asperger's. Sometimes when they said a child may have asperger's I thought - but I relate to things they do, like memorising stories or playing quietly on their own. It has been a bti of a strange experience and quite tiring someetimes, although it si positive in that I've been able to help people. Anyway I hope everything goes OK. I think I can see where your husband is coming from and in many ways I feel for him. Working long hours does sap your motivation for cooking and house work. But he needs to let you get on with it. It's not like you're not willing to do it. So perhaps divide it up in a time-table. For example, on Monday, Wednesday and Friday your husband comes home and is solely responsible for being dad whilst you sort the meals and house work. On Tuesday and Thurday it's role reversal and you're mum and he does meals and house work whilst at weekends you share and do it all together. If he doesn't let you do it... then it's pointless to argue about you not doing it. And if you're not doing it then you're not developing your skills or coping mechanism for it. Thanks both of you for your messages. You sound very similar to me Nicky! I've always been slow to get things done at work and home. I've also wondered if I might have some elements of aspergers sometimes too. I'm a primary school teacher (when I'm not at home being a mum) so I also work in schools and I see elements of myself in some SEN children too. It was teaching a dyspraxic child a few years ago (and helping with his diagnoses) that made me think I'm probably dyspraxic myself. He was so much like me at that age! I've also seen some elements of myself in children with aspergers too. I think there are some cross overs between dyspraxia and aspergers as well as other kinds of autism. Whatever the label though I figure I'm still just me! I'm glad you found a role at work that sounds like it suits you a bit better now anyway Nicky. It must really bring out your strengths and I hope it continues to go well for you. Feel free to chat/message me anytime as we seem to have a lot in common! Plus I may need more experienced mum tips along the way!! Hello as well Jim. Thanks for your thoughts on my situation. A time table with agreed nights for cooking etc could well be the way forward and it's probably worth a shot, so thanks for the idea and the blokes perspective! I am quite freaked out by the idea of cooking more though. I haven't cooked much in years and I was never very good at it. My husband used to love cooking and was quite possessive about the kitchen so I left him to it. Now we have a baby though we're both a lot tireder (she's not a good sleeper and she wakes us up a lot in the night) so I think now he'd appreciate me taking a turn more. I will try. Nice for him to have more Dad time too. I think I'll start really basic - pasta with a shop brought sauce or similar - and go from there. Give me luck!!! 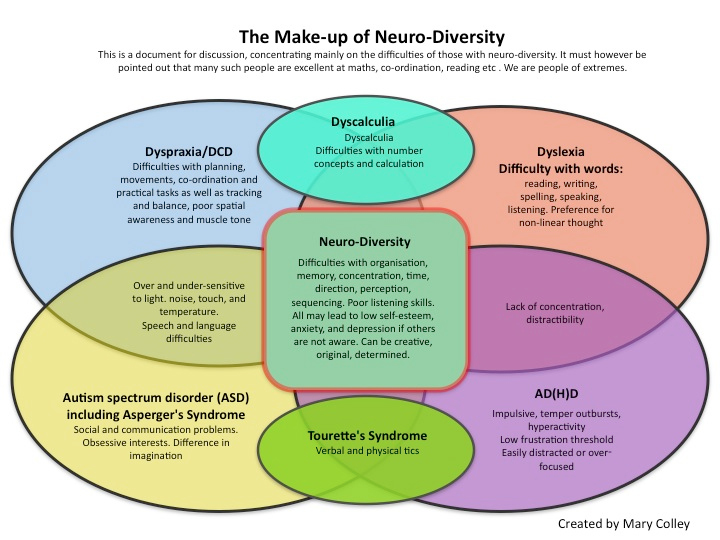 Learning difficulty is a broad spectrum and much of it overlaps.. everyone is still an individual with their own unique strengths and weakness. No diagnosis is a definitive list of symptoms which you must have to qualify for a condition. Try not to be too intimidated by the cooking, it's really not as difficult as some people like to make out. Ok.. Watching some celebrity chef at work doing something fancy and convulated makes it look like some kind of art. But you can still do delicious meals simply without all that faff. Thanks for the chart. Really interesting and helpful. I will try not to be too intimidated by cooking but it is something I have a real mental block about. My early experiences of cooking were in school cookery lessons which were massively stressful! I went to such a strict, old fashioned school. We'd be given a recipe to follow and ingredients then we'd get on by ourselves in silence whilst being timed. I hated it and had various culinary disasters! I never really cooked at home with my mum (or dad) as I went to boarding school when I was very young then I left home and school at sixteen (I went back and did my A Levels when I was older). I then lived on cereal and baked beans for years until I met my husband. So I've honestly never learnt to cook at all, not even the basics. Now I'm a mum I'm aware that this must change but it is genuinely quite scary for me. Still I will find a way. I once thought I would never be able to pass my driving test and I drive everywhere now, so anythings possible! I agree that keeping it simple and faff free sounds like a plan though. Hehe forget school cookery lessons... I don't think I learnt a single thing in them. Where you really learn cookery is at home. And Google is a good resource for tips and recipes. Simple dishes done well can still be delicious. I quite like cooking now but used to hate it. I do think sometimes I'm a bit paranoid and I think everything is down to having dyspraxia - I now realise that a lot of people do struggle with things. I used to think everyone else could do everything brilliantly, but I'm starting to realise it's not true. But I do think we have extra difficulties - especially I find with timings, and organising myself. The pratical tasks like cutting things up are a lot easier - I find the more I do something, it becomes easier, and if it's something repetitive I can get quite good at it. It's when I have to do something 'suddenly' - like putting up a piece of equipment that I struggle. I did have a book called 'How to boil an egg' when I was younger and there are lots of good books/websites with recipes. I find it hard to get things ready at the same time, but it is quite tricky. I have finally learned to clear up as I go along - I used to live in such a muddle. It's still not perfect, but then I'm not that bothered about perfect now (I try to tell myself anyway!) I often didn't notice mess - I would be busy clearing up a tiny corner of the bookshelf or something and think I'd done a lot of work and my husband would come home and say everything's a mess, you haven't emptied the bins etc! I think now he understands that it's how my brain works he is nicer about it, and he can help me because he is more organised. I have other skills though. It can be disheartening though can't it? I seem to take up a lot of energy and time doing things that other popele seem to find easy. I'm a bit over-sensitive - someone only has to say to me something like 'why do you have to stop to look in your bag - why can't you just get your keys out while you're walking along', and I feel like screaming. It reminds me of being back at school. I was also sensitive to tastes - I didn't eat any fruit and vegetables until I was about fourteen, and then it was only peas and mushrooms! I don't like 'messy' things to eat with my hands - I like my sandwiches plain, but I will eat curries because it's with a knife and fork! Bit mad i know, but that' s me. I can get stressed about it, althoug not as much as I used to. Anyway I hope everything goes well Katherine. I think the key is not to be too hard on ourselves. We tend to overlook our good points. Taking your daughter to groups and getting her used to people is great. I used to like helping in the school reading, and doing 'Music with Mummy'. My daughter now loves singing and wants to go to drama school. I think we often have more undrstanding of other people which can only be a good thing. If there were more people in the world who were a bit kinder, the world would be a better place. I can identify with lots of what you say again. I too tend to forget things like doing the bins and I also have to stop to look for my keys in my handbag. Far too hard to do that on the move! Those things can be frustrating you're right. I will try to be less hard on myself about the things I'm not so great at though. It's tricky to be positive sometimes as I'm a bit of a joke in my family and even my husband does tend to get very frustrated with me. However, I feel I've achieved quite a lot against the odds in life so I will try to believe more in the good bits of me such as my resilience and persistence. Traits I think we'd be lost without with dyspraxia! I do try to be kind and understanding of others quirks too and, you're right, if only everyone could try to be kinder and more tolerant! I will persist in doing my best in life and as a mum and see what comes of it. I hope you continue to do well in your job too and with your daughter and dog! It's great that your daughter is interested in drama. You must have raised her to be quite confident which is credit to you! That's very kind of you to say Katherine - I did want her to be confident where I'm not, but I'm not sure how much is down to me, and how much down to her personality. But hopefully I have done my best. Fortunately she doesn't seem to have any of the dyspraxic traits and she's good with her hands at art and sewing. I find I get very tired sometimes, it takes a lot of concentration to do everyday things. I admire you going teaching. I'm a teaching assistant and it can be hard, but I do find it gives me a lot of patience. I do still struggle organising myself and I lose things (or misplace them!) But things are getting better. I find that knowing about dyspraxia has helped me a lot.